Crock Pot Carne Asada style slow cooker beef recipe is an easy to make Mexican food main dish that’s perfect for Taco Tuesday, nachos, fajitas, street tacos, chili, burritos, or any other fun dinners! It’s a simple and delicious way to make a weeknight meal into a taco bar party. This tender delicious beef recipe reminds me of a taco truck recipe, and it fits nicely into a budget, because you can use inexpensive stew meat. Serve it with guacamole, sour cream, pico de gallo, salsa, chopped white onions, and cilantro. 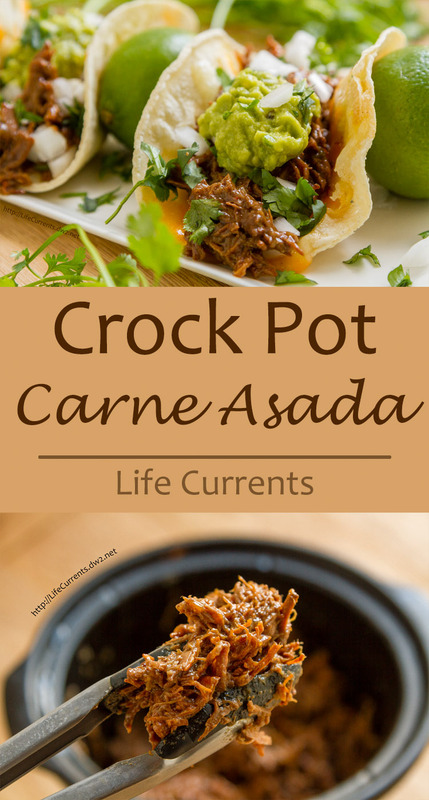 Everything you love about carne asada but easier, because it’s made in a crockpot! It may not be 100% authentic, but you’ll love how easy it is, and how delicious it is. Perfect for taco bar parties. This is one of my favorite dishes to serve while watching the game. Welcome to October is Tailgating Snacks Month! The 3rd annual! With an awesome recipe for Crock Pot Carne Asada. Wow! Some of my favorite recipes have come from this month! Want to check them all out? I have links lower in this post! I’ve very excited to start this month off with a BANG! It’s so easy to make too! If you can’t get out to the grill (maybe it’s too hot outside or maybe it snows where you live), you can still have great Mexican Carne Asada from the crock pot or slow cooker! This Slow Cooker Carne Asada is super easy to make and was a HUGE hit in my house. We made it into tacos, sandwiches, served it on a taco bar (a hint for something I’ll be sharing later in the month), made it into tostadas, you get the idea! Want to check out my tips and tricks for How to Host a Taco Bar Party, click here. And this crockpot dish smells Ahhhh-MaZe-ing as it cooks! Our new Crock Pot Carne Asada recipe is based on our traditional Carne Asada Marinade. We wondered how it would come out if the beef cooked in the marinade in the crock pot. Well, it’s fabulous! Dan loved it! It makes great tacos, sandwiches, and lots of leftovers. Perfect for parties. I wanted you to be able to see what I meant in the recipe by “The beef should be mostly submerged in the cooking liquid”. You can see some of the beef chunks, but they are mostly covered. Here the liquid is starting to boil and smell divine! Crock Pot Carne Asada after cooking. We just shredded this by pressing on it with a spoon, and it’s so tender that it falls apart on its own. One of our favorite meals - tacos! Done easily and deliciously in the crock pot or slow cooker! Great for parties, tailgates, taco Tuesday, Cinco de Mayo, or anytime! Working in batches so as not to crowd the pan, brown the cubes of beef in a large skillet, cooking until well browned on all sides, about 10-20 minutes per batch. Remove beef from pan once it is browned and place it in the crock pot. Add 1/3 cup water to the pan, and deglaze the pan, scraping the browned bits up from the bottom of the pan. Pour the deglazing water into the crock pot. In a medium bowl, mix all remaining ingredients with a whisk until thoroughly combined, and pour over the beef. The beef should be mostly submerged in the cooking liquid, if it isn’t add a little more water to the pot. Turn crock-pot on high, and cook, covered, for about 4 hours or until beef is easily shredded. Serve Carne Asada in tacos, burritos, nachos, sandwiches, anywhere you want tasty Mexican food. I figure we got anywhere from 8-12 servings from this recipe. It'll depend on how much you eat, and what else you put in your tacos. This looks delicious. I am always hunting for new ideas for easy weekend meals. This just got added to the list. I love the ease and versatility of it. Gosh these look AMAZING! I need to make this for my family, I think they’d love it! mamma mia! I’m pinning and making this goodness asap. that carne asada looks so mouthwatering!!!! This Carne Asada looks amazing. I have never tried cooking it in a crock pot so thanks for the recipe! Yuummmm. Love the hit of citrus! My family would flip for this, and it looks so easy. Love it! This looks so good! I always need slow cooker recipes. Oh my goodness, I need to try these! Like, soon! Oh wow. Those look absolutely delicious. This meal looks incredible and I loved that it’s made in the slow cooker! THIS is why I watch sports. For the carne asada on the side! That meat looks so juicy and delicious! Perfect for tacos. Mexican food is my life right now! So much fresh flavor! Hands down one of the tastiest, easiest recipes ever! Not exactly low carb, but far from high carb for sure. I’ll be making large batches of this to freeze! Deliciosa y gracias!